OCTOBER 26 EDIT: YOU CAN STILL BUY TICKETS- JUST PROVE IT WITH YOUR PHONE! 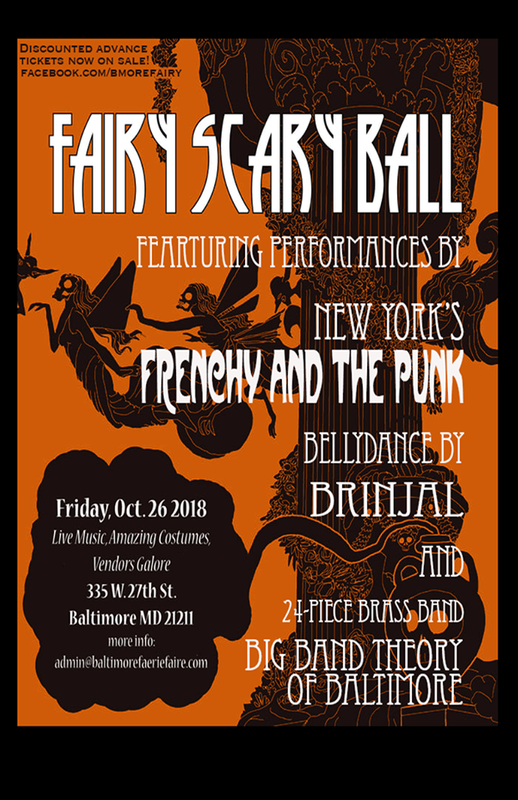 The Big band theory of Baltimore - 3 bands! Gone will be the Summer Fae; the Cold Winter Fae are come! On this night, the Unseelie Court takes over. 335 W. 27th St., UPSTAIRS, IN THE LABYRINTH OF THE CHURCH OF THE GUARDIAN ANGEL. VENDOR APPLICATION IS HERE - click this dead, grey text! Frenchy and the Punk are a Euro-American folk punk cabaret duo based in New York City. They are regarded as one of the top steampunk cabaret performers in the world. Scott Helland formed Frenchy and the Punk with singer Samantha Stephenson in 2005. Faeries LOVE them. Your feet will dance unbidden by you. Your name will be placed on the Door List. No physical ticket will be sent. Welcome to Fairyland! The Friends of the Fae offer this lovely wineglass, into which we are happy to pour water, wine or tea. Sale priced for a limited time. Two (2) tix to the BALL! Your name will be placed on the Door List TWICE. No physical ticket will be sent. Welcome to Fairyland! Your ticket in plus a bottomless wineglass. No physical ticket will be sent- your name will be on the doorlist and the bar will give you a wineglass.